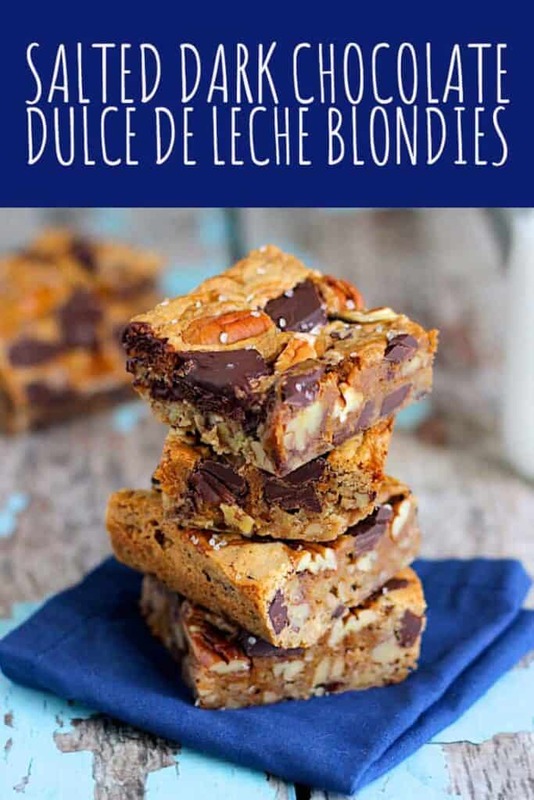 These blondies have chocolate, nuts, salt, and dulce de leche. Tell me, does it get any better than that? 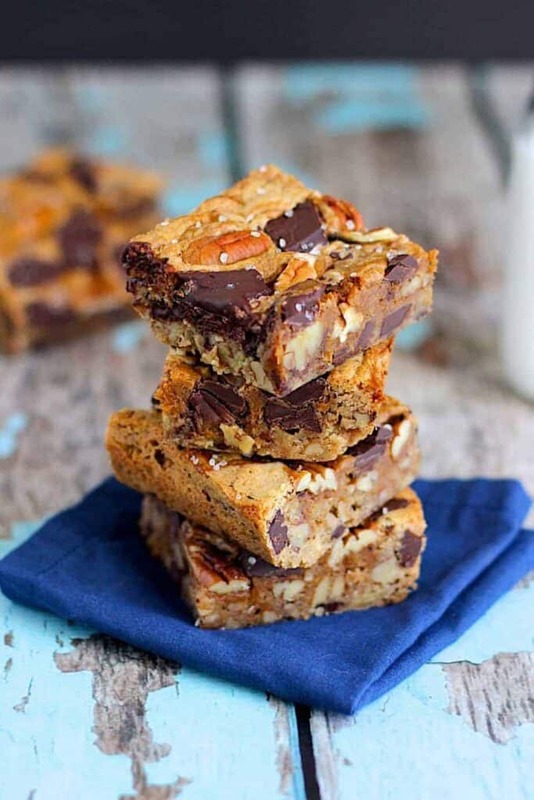 I made these blondies a couple of weeks ago according to the original recipe, and while they were really quite good, I felt like they were missing something. Enter: more chocolate, bourbon vanilla, and dulce de leche. To be completely honest, I had some reservations just before adding the dulce de leche. Was I going to ruin these blondies by adding one too many flavors? Fortunately, there was no real need for concern. These blondies came out simply amazing. 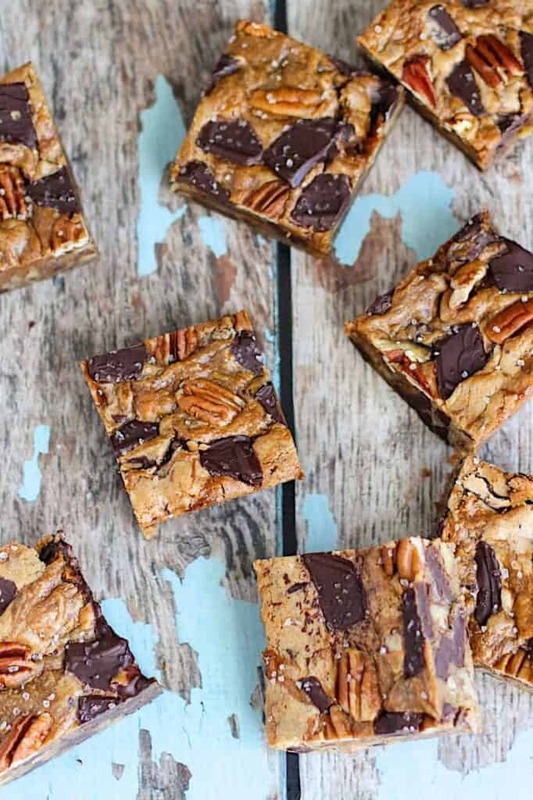 The sea salt and the bitter chocolate completely balance out the sweet caramel, and the pecans add a nice textural contrast. 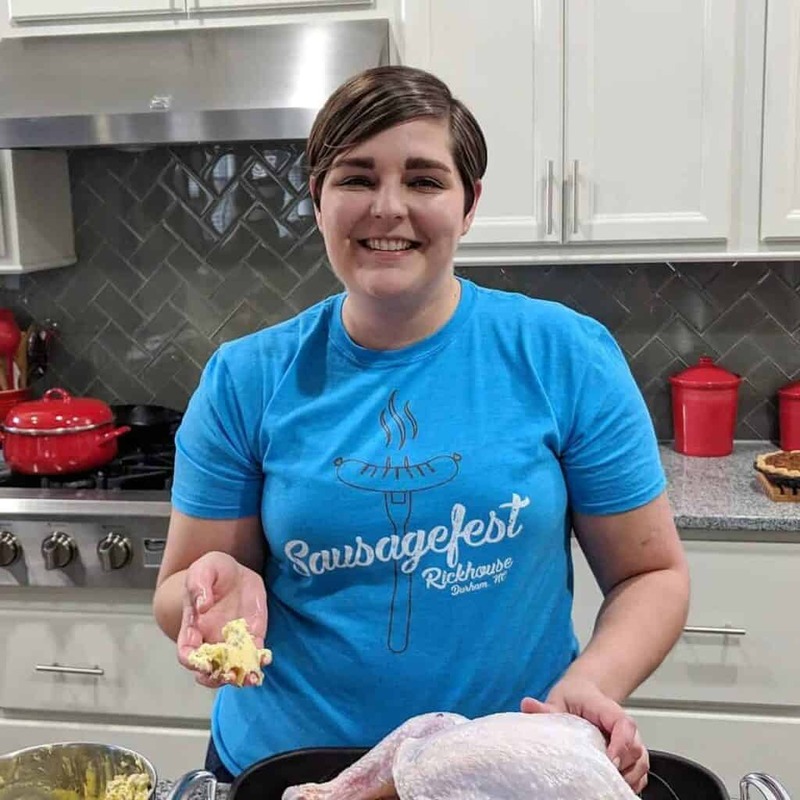 This recipe is adapted from The Whole Bite. Preheat the oven to 350 degrees F. Line an 8x8-inch pan with parchment paper, spray with cooking spray, and set aside. In the bowl of a stand mixer, mix the melted butter and brown sugar together until smooth. Add the egg and vanilla, and beat until combined. Add the salt and flour, and mix until just combined. Scrape down the sides of the bowl as necessary. Fold in the chocolate chunks and pecans. Pour the batter into the prepared pan in an even layer. 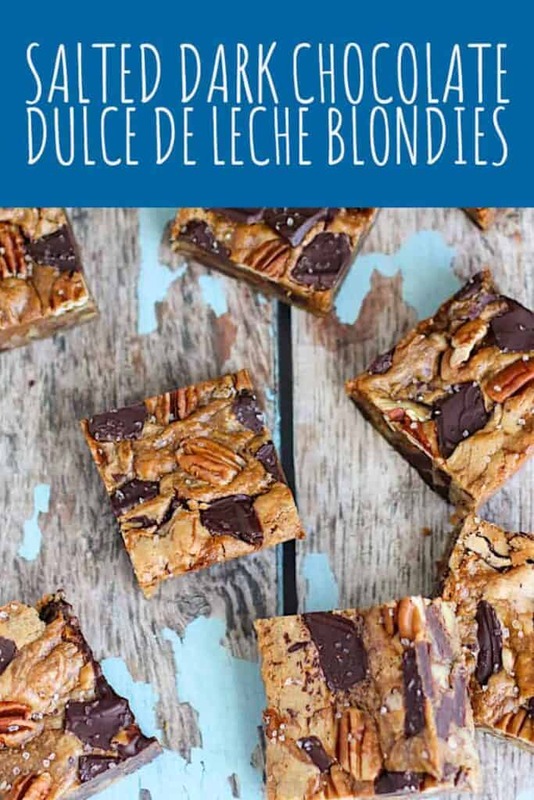 Dollop the dulce de leche on top of the batter at random, and use a knife to drag it around, swirling it throughout the blondies. 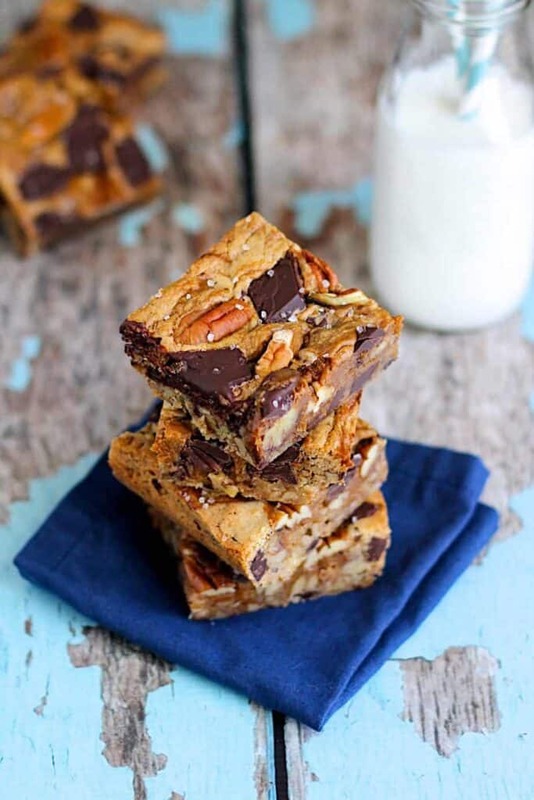 Press the reserved pieces of chocolate and nuts into the top of the blondies. Bake 25-30 minutes, or until the blondies are set in the middle. Remove the blondies from the oven, sprinkle some sea salt on top, and allow them to cool completely in the pan before slicing. 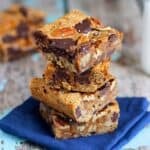 If you’re looking for more bars/brownies, check out theseTriple Chocolate Raspberry Brownies or Salted Caramel Apple Pie Bars. Those look amazing! Great recipe. I made these and shared them with my coworkers. They all loved them so much! Thank you for sharing! Hi Jean, thank you! Dulce de leche is kind of like caramel sauce. It’s made by slowly heating sweetened milk. You tend to see it in South and Central American cooking. But you can totally find a jar of it in your local grocery store (usually in the international aisle)!